I hadn't read any of Martinez's books previously although I've heard he would be up my alley since I'm a fan of Tom Holt, Robert Rankin, and Christopher Moore who he has been associated with. When I saw the cover and read the description I just knew this would be the one to try. 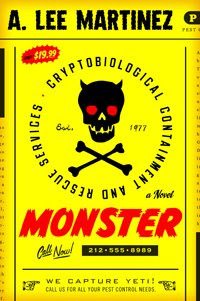 I'm a sucker for cryptids and funny fantasy in this case funny urban fantasy. I managed to finish Monster in 3 sittings which is quick given my hectic schedule lately. Monster is a zany mix of Christopher Moore's humor with the inventive flair of Douglas Adams. It starts off hilariously and barely gives you time to breath between giggles with its delightful dialogue and sometime silly action. Monster abounds with a veritable menagerie of mythical monsters such as yetis, kobolds, sphinxes, and pretty much anything you could or couldn't dream up. This is a world where magical things happen but most people forget about them soon after they witness them. The sometimes blue, Monster the main character/anti-hero is kind of like the cleanup crew of mythical monster kind with a strange ability best left revealed through reading. In other words he is the dog warden of weird varmints. Chaos is drawn to Judy who is a grocery store clerk and a bit of a failure in life. The character development is not very deep, which leaves Monster (the character) feeling a bit flat and also makes it a little hard to care about Judy. Both are just making the motions going through life and not caring to accomplish anything. Monster is actually a bit over the top in his reluctance to not get involved at times to the point of being unbelievable. However the situations and dialogue are what you want in a book like this so I can overlook these flaws for the pure entertainment Martinez gives us. On the flip side Chester, a paper gnome, is Monster's partner in crime and adds a nice counterbalance. Chester in actuality is a being from a different dimension just inhabiting the paper body for work. Monster's girlfriend is a super-hot succubus and there is of course a crazy cat lady who is up to something. The book is quickly paced and the fight scenes are a lot of fun especially one involving a herd of trolls. The magic Monster employs is logical yet he plays it mischievously well and I feel like there could be a lot more to this world especially given the climatic ending. Although a very different monster this is close to on par with Christopher Moore's The Lust Lizard of Melancholy Cove. Monster won't win any high literary awards, but If you are in the mood for a light read and a few laughs this is definitely the one to pickup especially if you've been reading a lot of long Epic Fantasy. I give Monster 7.5 out of 10 Hats. I'd love to see a short story from Martinez covering Monster teaming up with Chester for the first time or maybe another book with these characters. 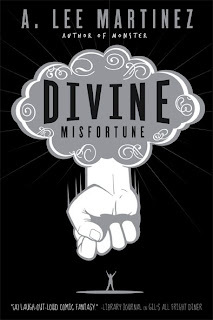 I'm definitely checking out Martinez's next book Divine Misfortune which Orbit is releasing in March 2010, but in the meantime I'll probably read his In the Company of Ogres which has been sitting on my to read shelf for far too long. I love Rankin & Moore so will be on the lookout for this one. Sounds like something that is up my alley!